Hawai’i Volcanoes National Park is currently recovering from the 2018 eruption of Kīlauea volcano. Much of the park has re-opened, but several areas are still closed. Read more. End of Chain of Craters Road is open. After driving more than twenty miles along the Chain of Craters Road, this hike is a great way to stretch your legs before the long drive back. 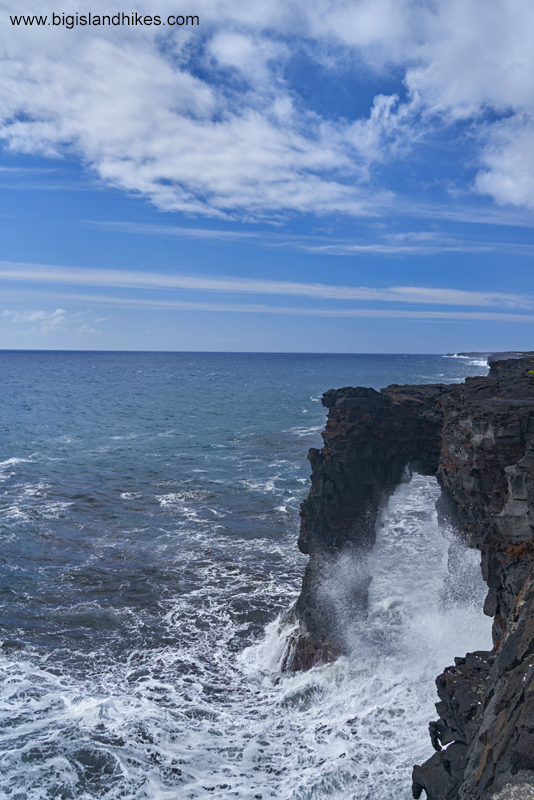 It's also a way to view Hōlei Sea Arch, a natural lava feature carved into the cliffy Puna Coast. This hike follows a paved road for about a mile where it was engulfed by lava. Trailhead: Find the entrance to Hawai'i Volcanoes National Park a few miles to the west of the town of Volcano Village. Pass through the entrance and drive straight ahead for less than 100 feet and turn left onto Crater Rim Drive. Follow Crater Rim Drive until it intersects Chain of Craters Road. Follow Chain of Craters Road for twenty miles to a dead end. Turn around and park off the road. There are restrooms but no water at the trailhead. Hike: First, hike south on a short trail over lava toward Hōlei Sea Arch. The trail ends at the sea cliffs overlooking this unique geological feature. Hōlei means 'a small endemic plant in the milkweed family.' The 500 year old arch is 90' high. It may not last much longer with the daily beating from the southern surf. Once you've enjoyed Hōlei Sea Arch, return to the parking area and then simply follow the closed portion of the paved road until you find the point where it transitions into a gravel road. Along the way, pass acres of lava created from 2003 to the present. It's worth exploring the lava off the road, but watch your step. Return the way you came.